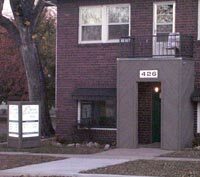 Our practice is easy to find at 426 North A Street. Our facility is in a residential area. We are a two story, road brick building located on the corner of A Street and Vine Avenue. A large three-sided white sign with black lettering lets you know you have found your destination. From the North. Travel south on Highway 77 (Summit Street) Dillons will be seen on your right hand side, make a left (east) on to Vine Avenue. One block, we are on the right-hand (southeast) corner on A Street and Vine Ave.
From the South. Travel north on Highway 77 (Summit Street) Dillons will be on your left and Pizza Hut on your right. Make a right (east) at that corner (Vine Avenue) We are located on the right hand (southeast) corner on A Street and Vine Ave.
From the West. Travel east on Highway 166 (Madison Avenue) to Highway 77 (Summit Street). Turn left (north) at the light, travel till you see Dillons on the left and Pizza Hut on the right, turn right (east) at the corner, We are located on the right hand (southeast) corner of A Street and Vine Ave.
From the East. Travel west on Kansas Avenue (Highway 166) to Summit Street, turn left (south) at the light. Travel till you see Dillons on your right make a left turn (east) at that corner (Vine Avenue) proceed one block. We are on the right hand (southeast) corner of A Street and Vine Ave.